All reef aquarists are well aware of how prone to disaster that their aquaria are. One of the common threads of wisdom in the hobby states that, "Disasters happen quickly, success takes time and patience." From this, the message is clear; when things go wrong, the resulting problems often occur rapidly. Aware of the precarious nature of our artificial ecosystems, most hobbyists do everything in their power to ensure that their beautiful, and expensive, creatures do not perish. Many hobbyists have safeguards for power outages, equipment malfunctions, water level problems, and chemical imbalances. It is ironic and unfortunate that all of these safety measures may be largely for naught, jeopardized by the use of artificial sea water that, due to poor formulation, may be poisoning the very animals that the hobbyist is trying to protect. Amongst professional marine biologists, particularly those who work with invertebrate embryos, the average artificial sea water mix has been recognized for many years as an imperfect substitute for what is the perfect medium for marine animal growth, pure oceanic sea water. This is particularly for delicate organisms such as embryos (Strathmann, 1987). Marine organisms have evolved in natural sea water, and natural selection has fine-tuned their physiology to this medium. Many of these organisms do not have waterproof skins, and the well-being of the creature is directly dependent upon the solution surrounding them. While there is some toleration of variations from the "normal" condition to those that the animals are attuned, generally that tolerance is small and limited only to the range of natural variation (Prosser, 1991). Sea water is not just a solution of sodium chloride and water, but rather is a complex and incompletely understood mixture of virtually every substance that has graced the face of the Earth. Anything that can be washed downstream eventually finds its way to the seas, and is incorporated into the solution of the oceans (Pilson, 1998). The vast volume of the world oceans ensures that the dissolved concentration of most of these materials is quite low, in the range of parts per billion or even less. One part per billion is a small amount, and to visualize such a tiny fraction, it is sometimes necessary to have help. One ounce per billion ounces might be visualized in the following example. If you assume an average person weighs about 150 pounds, one part per billion would be equivalent to a one ounce first class letter in the pocket of one of 416,667 people And yet, organisms do respond to materials present in even much smaller concentrations than parts per billion. At the basic cellular level, all life is dependent upon the proper functioning of a complex series of interconnected and coupled chemical reactions. These reactions are governed and controlled by enzymes whose capabilities are determined by the properties of the internal cellular environment. In many marine creatures, the internal cellular environment is directly dependent upon the sea water medium that surrounds the organism. Changes in salinity, for example, are often directly responsible for changes in cellular metabolism. Additionally, chemicals dissolved in the sea water medium may directly affect the cellular functionality. This is particularly true of metal ions in sea water. Metal ions result from the dissolution of some metal salt in water, and are often very important in the functioning of enzymes. In the proper amounts, various metal ions ensure that enzymes are of the correct shape and have the appropriate function. When found in the wrong concentrations, however, many metal ions may interfere with, and change, the structures of enzymes. These changes generally cause serious problems to the organism. For example, very small amounts of copper, precisely those amounts normally found in natural sea water, are absolutely necessary for the correct functioning of the respiratory pigment, hemocyanin, in arthropods and mollusks. However, a slight increase in the amount of copper in the water surrounding the organisms will result in a similar increase in the internal cellular environment resulting in the denaturation of other cellular enzymes, killing these same organisms. Copper is not the only metal which forms ions that interfere with cellular metabolism, in fact, this interference is a general property of most metals, particularly those that are termed "heavy metals." These are elements such as copper, mercury, iron, lead, silver, zinc, vanadium, nickel, and any number of others. The very lethality of these materials to all life, including humans, is what has prompted many of the environmental regulations concerning discharges into waterways and the oceans. Prior to the advent of many organic pesticides, many of the pesticides in use were simply mixtures of various salts of copper, zinc, arsenic, mercury and other "trace metals." Present in very low concentrations, generally those found in natural sea water, most of these materials are not harmful; however, in slightly elevated concentrations they kill organisms. (See, for example, Alutoin, et al., 2001; Breitburg, et al. 1999; Goh, and Chou, 1992; Heyward, 1988; Negri, and Heyward, 2001; Reichelt-Brushett and Harrison, 1999). Over the past couple of years, I have documented the abnormally high level of heavy metals found in aquarium systems, and have speculated that these metals are causing some of the mortality or "fragility" of organisms that hobbyists experience in their aquaria (Shimek, 2002a-e). Many heavy metals are continually added to aquaria in the foods that are necessary additions to reef aquaria (Shimek, 2001). Organisms typically detoxify heavy metals, even at normal levels, by binding them irreversibly to proteins in their bodies. This results in an accumulation of toxic material in the animal throughout its life span. If such organisms are used in the formulation of aquarium food, or fed directly to the aquarium organisms, the resulting feedings can transmit quite high and significant amounts of heavy metals into our systems. The old Army Corps of Engineers dictum of "The Solution to Pollution is Dilution," is valid and, on natural reefs, partial dissolution of foods, digestion, and excretion will result in the dissemination and consequent reduction of the potentially toxic trace metal loads. In aquaria, however, unlike the real reef there is nowhere for the metals to go. Filtration and export may remove some of these materials, but this not a particularly efficient process (Shimek, 2002e), particularly considering some of these heavy metals may be found in excessively high concentrations. Many of these excessively high concentrations, however, do not result from feeding, or even the ridiculous and dangerous process of adding toxic metals directly to tanks in the form of additives, but instead are the direct result of the formulation of the salt mixes (Atkinson and Bingman, 1999). Although the potential toxicity of such formulations has been commented on, there have hitherto been no direct quantitative tests of waters made with artificial salt mixes to determine if they were, by themselves toxic to organisms. This article reports on the first of those tests. "Does the type of artificial salt water used have an effect on the number of larvae that can develop after a given amount of embryonic exposure to the specific medium." In brief, for this test, I placed approximately equal numbers of early stage developing embryos (= fertilized eggs) into beakers of various types of sea water, and after two days I counted all the larvae that had developed in each beaker. The numbers of larvae found in each of the solutions were then compared to assess any differences between the solutions. Additionally, the numbers of larvae from the test solutions were compared to the numbers found in natural sea water (a negative control) and in solutions of cupric dichloride, a known toxicant (a positive control). I tested the following salts: Instant Ocean (Aquarium Systems, Inc.), Bio-Sea Marinemix (Aqua Craft, Inc.), Crystal Seas Marinemix - Bioassay Formula (Marine Enterprises International, Inc.), and Coralife (Energy Savers Unlimited, Inc.). The Instant Ocean and Coralife were purchased from Drs. Foster and Smith. An unopened package of the Bio-Sea Marine Mix was supplied by a reef aquarist. The Crystal Seas Marine Mix - Bioassay Formula was shipped directly from the manufacturer. I also tested the aquarium water from two hobbyists who each sent me a gallon of their tank water to test. That water was collected and shipped in plastic one gallon distilled water containers that had been purchased; the distilled water was discarded and the containers filled with tank water. As that aquarium water arrived some time before the test, it was stored frozen until just prior to the test when it was thawed and brought up to room temperature. Both hobbyists mixed their tank waters using Instant Ocean. One hobbyist used RO/DI water, the other hobbyist used well water. Natural sea water was obtained from Catalina Water Company(1605 Pier D Street, Long Beach, California. 90802). One day prior to the arrival of the test animals, I mixed up one gallon of each of the salt mixes to be tested. All vessels used in the test had been acid washed and rinsed well in distilled water and allowed to air dry. The salts were mixed to a specific gravity of 1.024 at 75°F, to match the natural sea water. These measurements were made with a hydrometer with a reference temperature of 60 deg F; and adjusted to compensate for the difference between the calibrated and ambient temperatures. Information about hydrometer calibration and use is available online in several sites. For each solution to be tested, I made up 11 replicates. Ten replicates were used in the test and were not disturbed during the test once the test was initiated; the other was used to observe the development during the test, if I thought that was necessary. Each replicate consisted of 150 ml of the test solution in a new, unused, 250 ml plastic Tri-Stir beaker. During the test, the beakers were covered with a plastic Petri dish, to prevent contamination or evaporation. No stirring or aeration was provided. All of the beakers were marked to indicate the solution within, and the beakers were arranged randomly on a table in my office/lab. The test was run at room temperature. This varied from 72°F to 82°F over the course of the study. This is a bit warmer than would be optimal, but within the range of acceptability for the species. The test animals were Arbacia punctulata, sea urchins found along the East Coast of the United States. I purchased 12 urchins from Gulf Specimen Aquarium and Marine Supply, Post Office Box 237, Panacea, FL 32346. These were air shipped to me, and were used upon their arrival. I unpacked them and placed them into a small aquarium filled with natural sea water at room temperature. Spawning was induced in the standard manner, by injection with two milliliters 0.53 M potassium chloride through the peristomial membrane into the perivisceral coelom. Spawning began immediately for most of the animals. Figure 1. Male Arbacia punctulata spawning. The animal is inverted over a beaker. The genital pores are on the aboral surface, here facing downward. Periodically, I would rinse the sperm that collected on the urchin into the water. The orange eggs from a previously spawned female are visible in the beaker to the left. Experimental beakers covered with Petri dishes are visible in the background. Eggs were collected by inverting the spawning urchins over beakers full of natural sea water. Sperm were collected by rinsing the sperm from the aboral surface into beakers filled natural sea water with a pipette. Of the 12 A. punctulata injected, 8 were males, 2 were females and 2 did not spawn. Upon completion of spawning, the eggs were rinsed by stirring them, allowing them to settle and by carefully decanting the overlying water. Fresh natural sea water was added and the rinsing process was repeated three times. The sperm suspensions were all mixed together, stirred vigorously, and a 1:200 dilution of sperm was mixed in a new beaker.. The eggs were microscopically examined to ensure that they were mature by the absence of a germinal vesicle and uniform shape. The sperm were microscopically examined to ensure sperm motility. One milliliter of the sperm suspension was added to the egg beaker and the solution mixed thoroughly by stirring with a pipette. Samples were removed and examined microscopically to ensure that the sample was fertilized. Once fertilization was noted, approximately one milliliter of the fertilized egg suspension was pipetted into each of the replicates (resulting in each replicate having between 50 and 80 fertilized eggs). Figure 2. Arbacia punctulata ovum prior to fertilization. This species develops rapidly at the temperatures used in this study, and after 48 hours the larvae had reached an early pluteus stage. This is the first feeding stage, and as I did not want to complicate the test by feeding the animals, the test was terminated at this stage. The beaker contents were examined under 40x magnification and all the plutei or other larval forms were counted, and recorded. This was done for all ten of the replicates. Generally, at this stage the solutions and larvae were discarded. Figure 3. 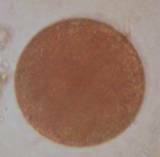 Development occurs rapidly, the two cell stage (left) and the four cell stage (center) were reached within an hour after fertilization. The prism stage (right) was present one day after fertilization. The prism is mobile and swims in the culture, but the gut hasn't developed and it cannot feed. Figure 4. The Arbacia punctulata early pluteus larva. Left: The larva at the stage where the test was terminated. Internal skeletal rods are visible as are red pigmented cells. The larvae is pyramidal in shape with apex to the right. 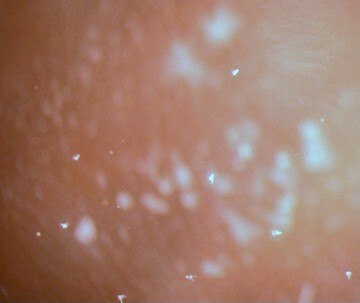 Although it has a gut, it is not visible in this image. These larvae move with the two long "arms" leading the way as they feed on algae. Right: A slightly older larvae that has been feeding on the unicellular alga, Chlorella. The gut is visible filled with the green algal cells. The test results were tabulated and a one way analysis of variance (ANOVA) was performed. Variances resulting from the ANOVA required the subsequent t-tests for differences in the sample averages be done considering the samples as having unequal variances. These t-tests were done by comparing the number of embryos in each experimental group (the four salt mixes and the two hobbyist tanks) to the number of embryos found in the natural sea water. All statistical tests were performed by the analytical portion of the Corel Quattro Pro 8 spreadsheet package. The number of larvae found after 48 hours varied widely (Table 1). The samples of the artificial sea water made with Instant Ocean contained on the average 4.0 larvae per replicate, while those with Coralife averaged 7.4 larvae per container. The samples from Hobbyist B also contained a low number of larvae, 5.1 per container. 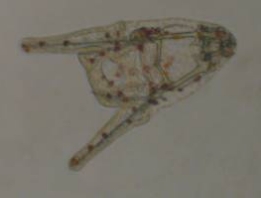 The average number of larvae from samples of natural sea water, Crystal Sea Marinemix-Bioassay Formula, and BioSea Marinemix all had a greater average number of larvae, ranging from 35.8 to 41.5 larvae per replicate. There were no larvae in the natural sea water dosed with cupric dichloride where the copper concentration was equal or greater than 100 ppb. Table 1. Number of Arbacia punctulata larvae (early pluteus) found after 48 hours. The cupic dichloride solution is used as a “positive” control, to show that the embryos will indeed be killed by chemical agents of a known concentration. The one way analysis of variance indicated a probability that all of the samples having the same variance as vanishingly small: P = 9.306 x 10-16 or roughly, one chance in 10,000,000,000,000 (Table 2). Figure 5. Arbacia pluteus larvae in the culture at low magnification. The larvae are the white, arrowhead structures. The mean, or average, number of larvae from each experimental sample was compared to the mean number from the natural seawater control sample using the t-tests (Table 3). It can be seen that the results of the samples from water made with Instant Ocean and Coralife salts, as well as the sample from Hobbyist B's water, each had probabilities of between 0.00003 and 0.00006 (or between 3 and 6 chances out of 100,000) of being the same as natural sea water. Conversely, the results from Crystal Sea Marinemix Bioassay Formula and Bio-Sea Marinemix had a 45 percent and an 85 percent chance respectively of being from the same group of results as those from natural sea water. Generally, biologists say that samples that differ with a probability of more than five percent (or put another way, those that have less than a 1 in 20 chance of being drawn from the same population) are statistically significantly different. So, the average number of larvae that developed in samples of water made with Instant Ocean and Coralife salts was highly statistically different, and far lower, than the number found developing in natural sea water. On the other hand, the average number found in samples of water made with Crystal Sea Marinemix Bioassay Formula and Bio-Sea Marinemix salts was not significantly different from that found developing in natural sea water. The average number of larvae found in the waters from both hobbyists was statistically significantly different from the average number found in natural sea water. However, at least in the case of Hobbyist A, the average number of larvae per sample was relatively close to the number in natural sea water. Table 3. The two-tail probability that the mean values of the number of larvae from the tested samples and the sample in natural sea water were drawn from the same population. Determined by t-test assuming unequal variances. Probability that the samples were from the group including samples from Natural Sea Water. These data are unequivocal and quite disturbing. They show that water mixed from some artificial salt water mixes is significantly more toxic to developing sea urchin embryos, and by inference to other organisms, than is the water made from salts sold by other manufacturers. It would be more acceptable, I think, if all salts were equally toxic. That would mean that no manufacturer had figured out how to make a decent salt mix, and if that were the case, then hobbyists would just have to learn to live with it. Or rather they would learn which species of potential reef aquarium animals were more tolerant of such abuse and could survive in it. However, that is not the situation. 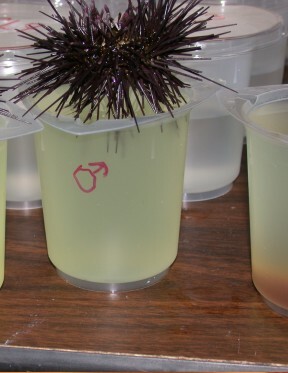 The situation is that waters made from some salts tested are much less harsh and have significantly better sea urchin larval survival than do others. At least the water samples with poor larval survival still have some survival, but by comparison with the number of embryos growing in the water from the other salts, the mortality of sea urchin embryos in water made from Instant Ocean is about 90%, and in water made from Coralife salt the mortality rate is about 80%. Animal response to toxins is a biological function, and is distributed with a "normal" statistical distribution, so the larvae seen in the waters made from these two salts are the hardiest of the hardy survivors. It highly likely that mortality effects are not limited to larvae and are much more widespread through the reef aquarium hobby. There is no particular reason to assume that reef aquaria are particularly more benign than natural areas where similar bioassays, and other tests such as chemical analyses, have shown other toxic materials to be present. Figure 6 . A two week old Arbacia punctulata pluteus. 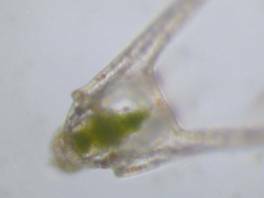 I kept a few of the larvae alive in the Bio-Sea Marinemix and the Crystal Sea Marinemix Bioassay Formula solutions feeding them on phytoplankton, which are visible in the center of the animal as a green patch. 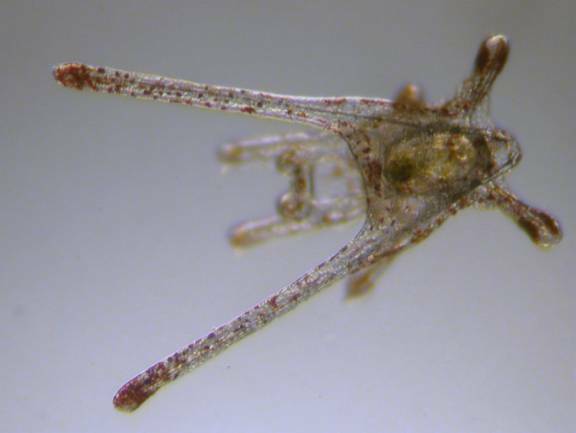 The extra arms at the top of the animal assist in feeding and locomotion; at this stage this animal is about 1 mm long. (Click for larger image). Table 4. Constituents of the salt mixes examined, in ppm. The data for Instant Ocean and Coralife salts are from Atkinson and Bingman, 1999. The data for Marinemix–Bioassay Formula were provided by the manufacturer. The data for Bio-Sea Marinemix are the average of two samples in the advertising literature from the manufacturer. The values for sea water are from Pilson, 1998.
t = values less than or equivalent to the tabled values. The concentrations given in Table 4 for the relative concentrations of most of the trace metals, which are in parts per million, seem very low and certainly appear as if they should be acceptable for growth of marine animals. That is, until they are compared with the average values for some of these materials in natural seawater. If the tabulated values for concentrations in the salt mixes are divided by the concentration of that material in natural salt water, the data assume a far different "acceptability" (Table 5). The data in table 5 are rounded to the nearest whole number and it can seen that for the known toxic elements of cadmium, copper, lead, nickel, vanadium and zinc, the concentrations of these elements in Instant Ocean are 342, 450, 210000, 213, 97 and 83 times, respectively, the value normal sea water. Similar values are found for Coralife salt. Interestingly enough, for the Crystal Sea Marinemix Bioassay Formulation the totals are 1, 4, 1930, 0, 1 and 36 times natural levels. While Instant Ocean and Coralife salts have 450 and 700 times the copper concentration found in sea water, in the Crystal Sea Marinemix Bioassay Formulation, the copper concentration is only four times natural levels. The two salts that made artificial seawater with the lowest survivorship of larvae consistently have heavy metals concentrations hundreds to hundreds of thousands times those found in natural seawater. Those salts that had the best survival had heavy metals concentrations that generally ranged about from, at worst, about one third to, at best, one thousandth those values. In other words, there are salts that are being made that are significantly better at allowing the survival of organisms, and these have significantly lower concentrations of the toxic heavy metals euphemistically referred to in the coral reef aquarium advertising literature as "beneficial trace metals." The pattern of larval survival in the positive controls, or those natural sea water samples dosed with cupric dichloride, indicates significant failure of larval development, presumably caused by copper, at copper concentrations between one and ten parts per billion. The number of larvae found in those copper solutions of one ppb or less, which roughly corresponds to natural sea water levels (about 0.2 ppb), is within the range of the numbers found in the natural sea water control samples. At ten ppb, the number of larvae in the copper-dosed controls is roughly equivalent to the number of larvae found in the Instant Ocean and Corallife mixes. Both mixes contain significantly higher copper concentrations (and much higher overall heavy metals concentrations), however, than was in the copper-dosed positive control beaker (Table 4). Additionally, the metals concentrations found in the water made with the salt mixes is far in excess of what has been demonstrated elsewhere to cause even more mortality and deleterious effects that were seen in this study (See, for example, Alutoin, et al., 2001; Breitburg, et al. 1999; Goh, and Chou, 1992; Heyward, 1988; Negri, and Heyward, 2001; Reichelt-Brushett and Harrison, 1999). That any larvae at all were found in the water made from these mixes indicates that some sort of detoxification is occurring. This may be due to a number of factors, including: some chemical, such as a chelating agent, added to the salt mix; some sort of competitive interaction between of all the excessive chemical agents present, or; some extrinsic factor, such as bacteria or sea urchin metabolite, introduced into the beakers during the test. Even though the seawater made from the mixes is toxic, it is less toxic than it should be. In this case, the whole is less than the sum of its parts. Table 5. The concentration of the various constituents of the sea water mixes as a fraction of the concentration in NSW. The values are rounded to the nearest whole number. There has been some discussion on the Internet, and other venues, about how, or if, these various toxic metals are detoxified in our aquaria. Proposals range from detoxification by binding with humic acids and sulfide minerals to binding with iron hydroxides. All of these may have some validity in tank situations. However, they also might not. The water from Hobbyist B was effectively as toxic as the freshly mixed artificial sea water from the two unsuitable salt mixes. With potentially toxic chemicals being found in mixes at levels tens of thousands of times higher than in natural situations, there are certainly enough toxic materials to go around. It is quite possible, and perhaps likely, that some toxic elements, such as lead, may be preferentially bound to some materials and rapidly removed from solution, while other elements may not be as likely to be removed. The resultant witch's broth would vary from one reef aquarium "chef" to another. Some tanks could become significantly more toxic than others, and the difference between the two tanks might be due to something as trivial as the presence of a particular strain of cyanobacteria in one tank and not in the other. This alga could be producing a byproduct that bound to and detoxified a given metal in that one tank and, of course, the other tank would experience more toxic effects. Additionally, while this study indicates acute toxicity specifically from two salt mixes, there is still the possibility of some long-term or chronic mortality from a chemical present in overabundance in those "good" salt mixes. This is of particular concern with the Bio-Sea Marinemix. Although this salt has much lower levels of most metals than are found in Instant Ocean and Coralife, the levels for some materials in the mix, particularly lead, silver, cobalt and lithium are still high enough to be of concern. Additionally, I didn't have good analytical values for some of the chemicals to assured of the levels (Table 4). Nonetheless, this salt mix produced water with good larval survival. All of these materials may cause some long term problems, and such chronic effects were not addressed in my short-term study. Additionally, the relative toxicity of other brands of salt mixes should be analyzed. Given the potential gravity of this study, it might be best to assume the worst, rather than assuming they are benign. That two hobbyist tanks may differ from each other as well as from the basic water produced by the artificial sea water mixes from which they both started with is apparent by comparing the data from Instant Ocean with those from the two hobbyists, both of whom used Instant Ocean in their systems. The water from Hobbyist B's tank was essentially as lethal to developing sea urchin larvae as was freshly made Instant Ocean. On the other hand, the water from Hobbyist A's tank, while not as good as NSW or the better mixes, was certainly much better for the animals in that system than freshly made basic Instant Ocean water. Some or all of this difference in results may have been due to an artifact of the experimental procedure. The freezing of the hobbyists' samples may have changed the chemical composition. As the water freezes, the ions don't get incorporated, and the concentration of salts gets higher and higher. Many of the precipitates will just go back into solution on warming, but some won't, especially calcium carbonate and anything that coprecipitated with it (perhaps including copper). It is impossible to predict, whether this would be more likely to make to water more or less toxic, but it is a potential complication (R. Holmes-Farley, pers. comm.). If the toxic water from some mixes is detoxified in aquaria after being added to the system, there are some profound implications for water changes. It would mean that with every water change, a mass of potentially toxic water is being added to the system. This water might be detoxified over time in the aquarium. Even if this water is partially or wholly detoxified in the system, such a detoxification will take time, and during that intervening period, the organisms in the tank will be being subjected to significantly higher heavy metals concentrations than they had been exposed to immediately before the addition of the newly mixed water. This study has demonstrated that the artificial sea water made using some common and popular commercial artificial salt water mixes is toxic to sea urchin larvae using a variant of a standard bioassay. Such water will also likely have effects on other animals. This study also showed that some artificial sea water mixes produced water that could support larval development as well as could natural seawater. The use of such "good" artificial sea water will promote the health of coral reef organisms. Coupled with a vigorous program of nutrient and trace metal export (See Shimek, 2002e), use of these salts should go a long way to prevent the build up of potentially toxic trace metals in coral reef tanks. Both of the salts that had good larval survivability are readily available at reasonable prices. The Crystal Sea Marinemix-Bioassay Formulation is not commonly available to hobbyists, being designed and marketed for bioassay laboratories. However, it is available online from various vendors. The Crystal Sea Marinemix - Bioassay Formulation is essentially the same as standard Crystal Sea Marinemix which it differs from only in lacking the dechlorinator found in the latter salt (R. Spellman, pers. comm.). Standard Crystal Sea Marinemix and Bio-Sea Marinemix salts are widely available. I thank Skip Attix, Eric Borneman and Dr. Randy Holmes-Farley for their reviews and helpful comments about this article. I thank Mr. Dennis Tagrin of DT's Phytoplankton for suggesting I try the bioassay salt formulation and I thank Mr. Robert Spellman, of Marine Enterprises International, for providing the Crystal Sea Marinemix - Bioassay Formulation salt and the analytical information about it. I am also indebted to Mr. Lewis J. Wright of the Catalina Water Company who graciously provided the natural sea water used in the test. Mr. Brian Wightman provided the Bio-Sea Marinemix. Mr. Bill Chamberlain and Dr. Frank Marini graciously provided me with some of the chemicals necessary for this study. With this, the concluding part of my several year long, multi-project investigation of reef aquarium water quality, I especially thank my wife, Roxie Fredrickson, for both putting up with these antics and diverting some of our meager funds to this effort.